Never one to shy away from publicizing my failures, missteps and adventures in the kitchen, I decided on Monday to film my attempt at frosting a layer cake. Having only done this a few times before, it was … quite a production. But as long as I can learn lessons from the experience (and eat the mistakes!) then that’s the important thing, right? The cake turned out looking okay, if a little lopsided. The reason for the cake was my birthday, which I share with several other people. 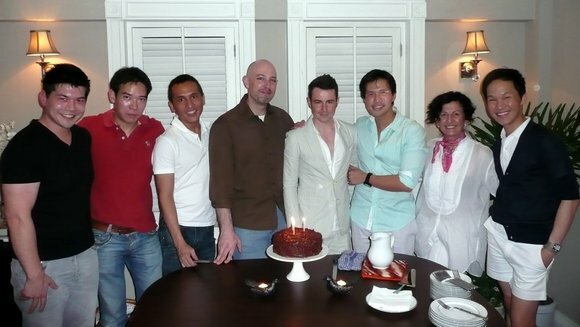 I celebrated in conjunction with Jason, an Australian friend who turned thirty this year. Our little dinner party group. From left to right:Benji, Matt, Kobfa, me, Jason, Bundit, Zenya and Tawn. 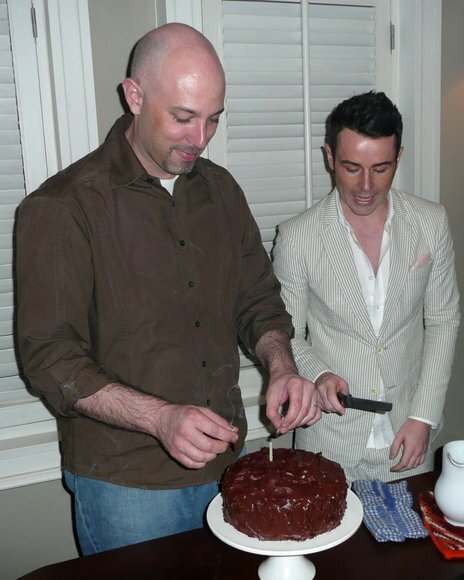 Jason and I have blown out the candles and prepare to cut the cake. Speaking of the September Issue, you can probably tell that one of us is a bit more of the fashionista. Oh, the sad thing is that I made a mango coulis to go with this, poured it into a squeeze bottle and placed the bottle into the refrigerator to chill, subsequently forgetting to serve it with the cake. D’oh! This entry was posted in Uncategorized and tagged baking, cake, cooking, food by christao408. Bookmark the permalink. I always figure as long as it tastes good, and looks like you tried, it’s good enough. xD On that note, it looks better than anything I could do. I am drooling. 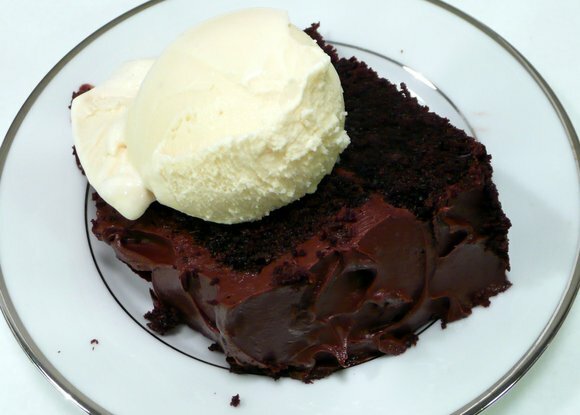 That cake looks so incredibly gorgeous, and the dollop of ice cream on it. Ummm hummm! Chris, you never tire of tempting my taste buds!! Happy Happy Birthday Again and Agian. Also Chris, who cares if it’s lop-sided or has lumpy frosting. All I want is to sink my teeth into that gooey mess. Promise me you will bake a cake like that when I visit you. the cake looks fantastic! I’ve never frosted a cake before (i dislike too much sugar), but it’s always seemed a little daunting. happy b-day! that cake looks great (and the frosting job looks good too… better than anything i would probably have done)! but i don’t think you should have had to make your own cake! Nice cake! “Thai Martha Stewart” in full swing!! Happy Birthday!! Happy Birthday Mr. Martha Stewart! You did a great job on the cake. Keep those videos coming you hear? Happy B’day! The story in my family is about my mother’s cake efforts. She rarely baked cakes – just for birthdays when my dad didn’t have time. For my sister’s cake, she had a problem with the bottom layer being almost pointed in the middle. Instead of trying to make it level by cutting, she simply leveled it by applying extra icing between the layers. The real issue was the crack that developed in the top layer (because of the point on the bottom). Her solution was to fill the crack with icing. It was a very tall cake. My sister was the lucky one to get a slice with a paper thin piece of cake on each side and a pound of frosting in the middle. My mother hasn’t lived that one down! Well, as long as the cake taste good… how it looks doesn’t really matter. Happy Happy Birthday, Chris! The cake looks yummy! 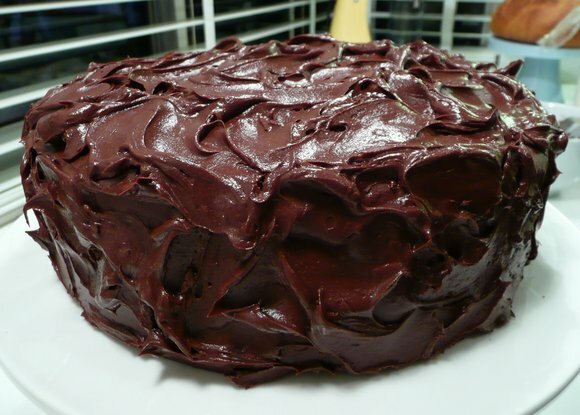 To share you a secrete, I have never bake a cake yet, let alone frosting it. Guess what, I am an expert in consuming them, smile! Happy Birthday. Happy belated!That looks pretty good though! Oh my! Could you not put pictures of something soooo delish on your weblog!? You are making me hungry. That cake is a piece of ART! Excellent work. @live_for_love – That’s true. Nobody there was going to dis a free cake! @brianchristopheryates – I had to google the name. I guess I can see a bit of a resemblance around the nose and eyes, especially in a profile shot. @Art4ArtSake – It is all part of my evil plan to make readers hungry! Buwah-ha-ha-ha! (evil laugh)@yang1815 – Thank you. I find it funny how we continue to comment on each other’s blogs when hanging out instead of just making the comment face-to-face…@Sc12EeN17aM3 – Thanks, it turned out pretty well. @stevew918 – Never baked a cake yet? What are you waiting for? =D@Dezinerdreams – You’re telling me that looks don’t matter? That’s like me saying, oh it’s okay that the fashion was lousy as long as it kept the wearer warm. =P@murisopsis – You had me laughing out loud, Val. I actually did a bit of “frosting fill in” for a portion of the cake that fell off on the side. @XXKimPossibleXX – Thanks. I’ll try with the videos. They take a lot of time and effort to put together but I enjoy doing them. @CurryPuffy – Thai Martha Stewart. LOL@kunhuo42 – If I don’t make it, who will? @secade – Thank you Chris. @ZSA_MD – Please come visit! I’ll bake you a cake. @osmundaregalis – Oh, I have a great choc souffle recipe. You can freeze them then bake them anytime you want and they turn out brilliantly. @ZSA_MD – Thank you again and again. @TheCheshireGrins – Can’t get any chocolaty-er than that! @christao408 – Haha I guess I forget about the blog while we’re hanging out! Well, Val has already told you about that cake! I also tried to decorate it with the squeeze thingy, and it ended up looking like it was decorated by a drunk! One of the little boys at the birthday party also got a piece that was mostly icing, but he didn’t mind. I do sometimes make nice loaf cakes and rectangular ones. I really love chocolate so now will hunt for some. By the way, I hope every day this year will be a good one for you. @Gma_Joyce – Thank you so much for the nice wish. @Wangium – Well, that would have been nice. But, frankly, I think I can do better next time.